All summer these two have been my patient little buds, sitting in this massive jogging stroller while I push it as far as seven miles around the city. The older one usually brings a book to look at, the baby seems content with the scenery. 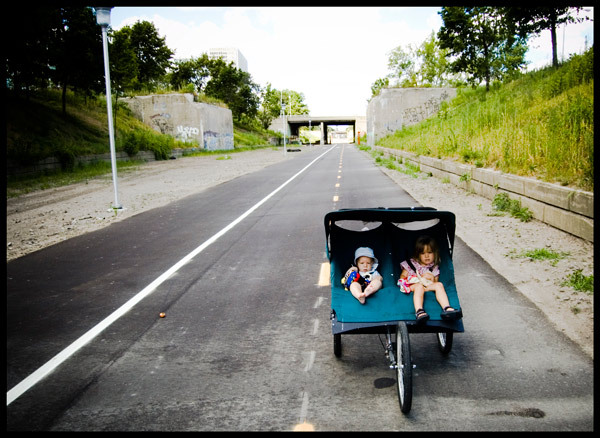 A month or so we started running up and down the 1.3 miles of the Dequindre Cut (I wrote about it here) which isn't yet officially open to the public but no one has ever hassled us about it. The graffiti artists have been working overtime down there lately, some in broad daylight. I know it's like the ultimate hipster dad BS you've ever heard, but I swear the kid (without provocation) wants to talk about the letters written on the wall, as in, "What are those letters and what do they say?" You try explaining graffiti tags to a three-year old. Not easy. I asked her why she thinks they write on the walls and she said, "Maybe they ran out of paper."